From Pirelli advert ‘Pottery & Glass’ 1958. Size: 70 mm 2¾" high. Holding nut. Also seen this size with dark green ears and tail - with no points on ears. Fish. Clear with blue fins and tail. And any others with labels please. Also notes on different sizes, height preferred. Horse. Clear, red ears and eyes. Deer. Clear with large red antlers. Deer. Blue with yellow antlers. Rabbit with carrot. Clear, light blue ears, red carrot. Rabbit with carrot. Clear, green ears, red carrot. Monkey. 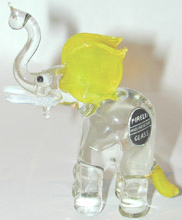 Clear with orange ears and white mouth. Mouse. 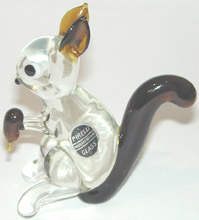 Clear with red ears, legs and tail. Goose or duck. Clear with red wings and green beak. Pig. 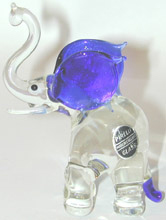 Clear with red ears (forward set) and curly red tail. Black & White images from an original Pirelli advert. Courtesy of Angela Bowey. Original advert can be seen in her article at the Glass Encyclopaedia on line. 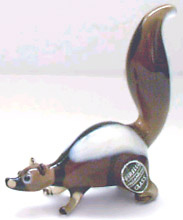 Skunk image copyright 2004 courtesy Tony Hayter, 1st Glassman. Stork2/Duck2 images courtesy and copyright 2004 Norah Petrie.